I have wondered what Miss Evans would think today about the careless way parts of speech are commonly used as if they were other parts of speech — like “hire” or “eat” as a noun. Remembering her also reminds me of the vagueness of the words we use, particularly in clichés like “size matters.” It does, but without further explanation, the phrase is meaningless. Is it too big, too average or too small? Such reflections led me to examine confusing myths about the restaurant business. Size obviously matters, but how? The greatest restaurateur I ever met was Jim Lark, a.k.a. James David Lark, J.D., Maître Sommelier Vins de France, Chevalier du Tastevin, Commandeur Honoraire du Bontemps de Medoc et de Graves, Commandeur L’Académie Brillat-Savarin, Confrérie de la Chaîne des Rôtisseurs. Most of those titles came with a sash and a medallion, all of which he wore as host. He was a lawyer who made a fortune developing the northern suburbs of Detroit after the racial riots of the 1960s. He then traveled with his wife Mary to borrow ideas from great restaurants around the world. Doors from a place in Patagonia, tables from Provence, door knobs from Italy, dinnerware from place in Catalonia, etc. For 25 years they owned and operated The Lark in Highland Park, Michigan. They described it as an upscale southern European inn. It was named the runaway winner of best restaurant in Michigan by Zagat and the best restaurant in America by Conde Nast Traveler. The actor Jack Nicholson became such a fan while filming “Hoffa” in Detroit that he frequently flew in from Los Angeles, just to dine there, and maybe see the Lakers play the Pistons. Jim Lark was more insistent than any restaurateur I knew that size mattered. In his opinion, a great restaurant never should have more than 50 seats. Actually, he had 100 – 50 indoors and 50 outdoors, but he would never take more than 50 reservations. His thinking was that if you have more than 50 seats, the majority of the actual cooking is done by secondary kitchen talents. Also he believed that to keep the best wait staff, you needed to guarantee them that every seat in their station would be filled every shift, not just on weekends and holidays. The Lark was always full, and reservations were made months in advance. Jim Lark is not alone in his thinking. Michelin’s restaurant guide, the most respected in the world, defines small as anything with less than 40 seats. Last year the guide named Araki in London its fifth-ever three star (the highest distinction and one that makes the American cliché “five star” seem obsessively American). Araki has nine seats. In Lisbon, the Taberna da Rua das Flores is so small that one table consists of two cushions on the stairs. It’s a way to eat its famous foods, but it’s still the staircase. Japan, which has by far the most total Michelin stars of any country (575), has several with less than 10 seats. Japanese revere small cafés, probably because real estate is so expensive and, as anyone who has seen “Jiro Dreams of Sushi” knows, the skills of the best chefs are handed down within many generations of the same family. If you have seen “Tampopo,” the first “ramen western,” you understand that even a simple bowl of noodles and stock is revered, and small cafés that make them well will be protected from the infringements of large, deep-pocketed places. Another thing in support of Michelin’s “small” restaurant standard is that customer conduct is considered compulsory. One does not talk too loud, argue or talk on the phone, even in small starred places with no dress codes. Joe Tripp has been Des Moines’ most awarded chef lately. 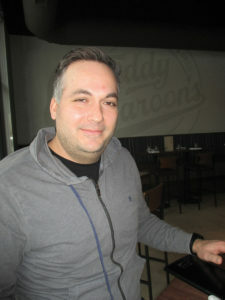 Marty Scarpino owns Jesse’s Embers on Ingersoll. It’s the only one of three Jesse’s that a previous owner had and the smallest with just over 50 seats. Because the restaurant is usually full of loyal customers from 50 years on Ingersoll, its clientele understands their no reservations policy. “We can’t be holding a table for someone who’s late, not when walk-in customers are waiting in line for one. The only people who don’t understand are usually first-timers. Our regulars don’t mind waiting for a table,” he explained. Jay Wang, who owns four Wasabi restaurants, sees size in a different way. “I am stuck on 90 seats. Even with that many, customers in the suburbs (he’s in Johnston and Waukee, as well as Des Moines) just won’t wait for a table. They will go to another place nearby. That’s not a problem downtown. There, people don’t mind waiting,” he said. That makes sense. Going out to eat downtown involves finding a place to park. That commits one. Wang’s places in the suburbs have lots of free, nearby parking, and lots of competition nearby. Joe Tripp has been Des Moines’ most awarded chef lately. He agrees with most of what Lark professes about small cafés. He can run a kitchen with just four people including himself. A partner in Harbinger with Jason Simon, he is able to buy in larger quantities, at bigger discounts than he would be able to on his own in a café with less than 50 seats. “Scott Carlson told me that we open ideas not restaurants. That doesn’t work if you aren’t personally able and willing to do any job, answer phones, wash dishes, etc. The biggest problem with being small is that you can’t buy from too many supplying companies. We run into $300 minimums on fish purchases. But collectively with Alba and Eatery A, we can get things we otherwise couldn’t make work. One company was charging us a delivery fee until we proved we were a good consumer. Then they dropped the fee,” he said. He sees one other distinct advantage in staying small. “The larger you get, the more apt you are to lose sight of details, and that’s where the magic happens. If someone gets up to make a call or use the bathroom in a small place, chances are much better they will find a clean, folded napkin when they return. There is more consistency. It’s also easier to change a menu seasonally in a small place,” he said. That’s an important point. Many believe that the much loved Sam & Gabe’s was fatally wounded by menu and recipe changes after two expansions and a change in ownership. 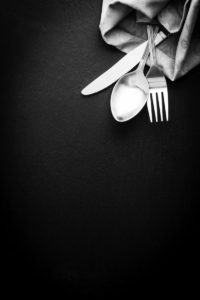 The restaurant had so many, longtime customers that changing the menu was unacceptable to decades-long fans. Tony Lemmo has experienced the small/expansion dilemma from both sides now. Tony Lemmo has experienced the small/expansion dilemma from both sides now. I first met him when he was selling sandwiches in the old Metro Market, a place that tried to be a year around farmers market. 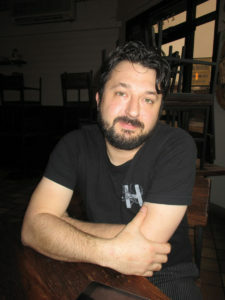 He later bought Café di Scala, an intimate 54-seat restaurant and opened two pizza joints – Franks, which is gone, and Gusto (average of 75 seats), which has expanded into a local chain. He converted Café di Scala into an events center called Aposto and later back into Café di Scala. He also opened a bar called Juniper Moon, which serves no food but takes delivery from the nearby Gusto. “I’ve made a lot of moves, and some have not worked out well. I was selling tickets for dinner at Aposto, and people did not like that. At the time it was a solution to the hassle of taking reservations. I was living upstairs of the café at the time and never felt like I had time to myself. I would take 13 emails or phone calls to make a reservation. Since then, restaurants have experienced the uberization of the industry. Open Table relieves us from taking reservations. There are other websites, software and services now that help us with delivery orders, design planning, etc. “All that has advantages and consequences. It’s easier than ever for someone with absolutely no experience in restaurants to open one. This has led to oversaturation of the market. Des Moines is overdeveloped with restaurants, and that hurts everyone. Some of us have started a hospitality breakfast club to share information. It’s ‘look in the mirror’ time for all of us. We have to think about where we want to be in three years now rather than five,” he explained. So where does Lemmo come down on how size matters? “We have to micromanage each store. They are all different. The Gusto in Johnston does a good lunch business but not a good dinner business. The Gusto in Waukee does a good dinner business but not for lunch. The downtown (Ingersoll) Gusto is solid at all times. The Clocktower Square Gusto is hard to figure. That’s why we only sell deep dish there, to balance its business. My partners mostly run the Gustos so I can focus on Café di Scala. I moved out of there so it’s easier to separate my private life from work,” he said. Lemmo agrees with Wang that suburban diners have less patience waiting for a table than downtown diners. He thinks more seats are needed in the suburbs. “When we built the Waukee store, we thought the town would grow west forever. That’s slowed way down and left us kind of stranded — an island between the cornfields out west and the country club to the east. There’s always something you don’t see when planning. “It also takes longer than it used to to find a clientele. Juniper Moon took three years to establish itself. It’s all about craft beers, cocktails and comfort. Café di Scala took two years to get back in solid black after the Aposto experience. Reservations remain an issue. I usually plan on an hour and a half to turn a table. I feel terrible when someone spends two or more hours and a table is not available for a later reservation,” he said. What other new phenomena are changing the business? “Netflix is hurting cafés. Particularly millennials often prefer staying home and watching a show instead of going out to eat. Post millennials particularly like food delivery,” he said. One maxim of the industry has long been that chain stores prefer new suburbs and independents do better in inner cities. A good part of that is based on the fact that chains are often deep-pocketed corporations that are betting on real estate value growth as much as on per store profits. McDonald’s has been ranked second in the world in real estate holdings. I have never driven by the Ankeny Olive Garden when their parking lot was less than packed. More indies are test-driving the suburbs, particularly ethnic places in Waukee. Yet no one I talked to disputed this old cliché. As Tripp noted, Scott Carlson, who owns Court Avenue Brewing Company, Americana and Gilroy’s and has been a longtime lobbyist for the restaurant industry, has long advised others that cafés are selling emotions more than food. Several new places, including Lemmo’s Juniper Moon, seem to suggest that more people are taking this to heart. Teddy Maroon’s is as much about high school nostalgia as it is about sports bar food. Two new Brazilian steakhouses are selling travel romance as much as seared meat, with gauchos slicing at the table. On the other hand, many people I talked to in writing this story complained that Des Moines restaurants do not understand the importance of mood lighting. (Café di Scala was often mentioned as the rare exception in town). Candle light is an endangered species in town, and windows, particularly south facing windows, need better management, as in use of shades. We will rate Carlson’s warning as real and relatively unheeded locally. People have long talked about doomed locations in Des Moines. Lots of addresses have gone through many quick changes of clients. Yet many of those just needed the right tenant. 2920 Ingersoll was one such locale until Wellman’s Pub moved in back in 1982. 1260 86th St. in Clive was another until Cool Basil took over and packed its dining room and parking lot. We will rate this myth as viable but defer to Lemmo’s comment about micromanaging each venue. Finally, many believe that the least cosmopolitan aspect of dining in Des Moines is that almost everyone wants to sit down by 7 p.m. It’s a little better on weekends, but everyone I talked to told me this is a problem. A restaurant trying to turn all tables at least once can not offer 7 p.m. sittings. It’s before 6:30 p.m. or after 8 p.m.